Co-founder of the once much-lauded Fernandez & Leluu Supper Club, Simon Fernandez was one of the early pioneers of what is now a thriving supper club movement in London. More recently though, Simon and his F&L supper club partner Uyen have since gone their separate ways to run their own projects. If you missed out on attending one of their events in its heyday as I did, Simon’s current Ferdies Food Lab venture continues to offer up that electric mix of creative cookery and alternative social experience which characterises London’s most talked about supper clubs. If there’s one thing that really sets Ferdies apart, it’s the venue. This is no living room turned makeshift underground dining space you would come to expect of a supperclub. Set in the Banquet room of the Grade II listed Toynbee Hall, it’s a striking yet quaint setting for a deformalised, multicourse banquet dinner. Simon’s menu is eclectic and globally inspired with a touch of molecular influences throughout. Expect anywhere between 6 to 8 courses, all beautifully plated on central sharing platters which gets guests interacting as they tuck into the food and share out what’s on offer. 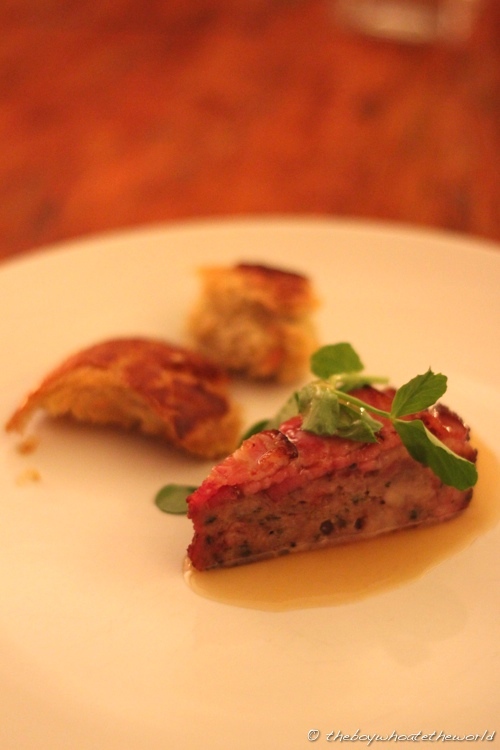 Our opening course paired a rustic country-style terrine with smoked apple gel. The terrine itself was meaty and succulent, packed full of pork shoulder, smoked bacon and herbs. What was even more delicious though was the bread on the side. Crisp on the outside with a semi-baked, almost ‘al dente’ like core, each bite released bursts of rosemary on the palate. The smoked apple gel however was less memorable… the consistency of it could have been thicker and I was expecting a bit more smokiness to come through. Swirls of bacon-spiked puff pastry served with shot glasses of a mysterious clear liquid soon followed. 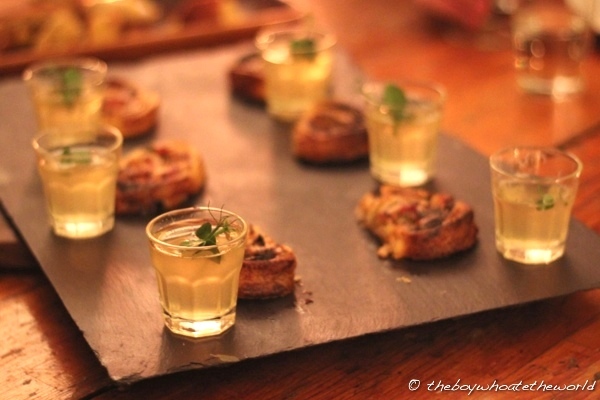 The pastries were tasty but it was undoubtedly the ‘Invisible’ Tomato consomme that stole the show, bringing wide-eyes and smiles out of everybody round the banquet table. If you could distill the soul of a tomato and put it in a shot-glass, I imagine the end product would be similar to the alchemy Simon’s achieved here. The flavour of the tomato was surprisingly full-on but it was nonetheless an inventive and playful dish that pushed the boundaries. 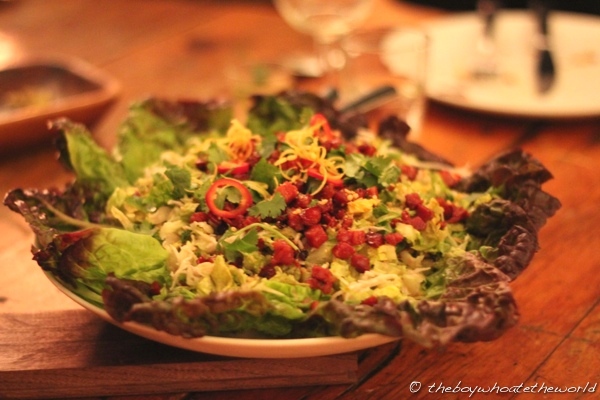 Next up, a refreshing Cambodian-inspired salad of celeriac and lettuce topped with bits of crispy chorizo. The zingy, citrus based dressing worked well with the spicy chorizo and the flavours reminded me of the delicious ‘larb’ mince meat salads that are native to South-East Asia. It was a bit of a hiatus before the main course arrived, but just a glimpse of the stunning plating which followed was worth the wait. 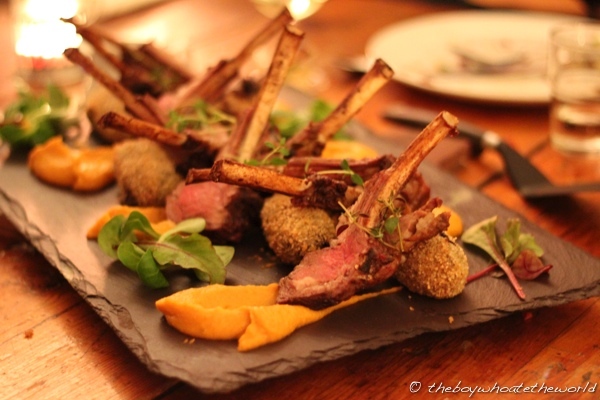 Aptly titled ‘Rack and Black’, the rack of lamb was roasted to a perfect rosy pink and paired with crunchy deep-fried croquettes of black pudding. A mouth-watering combination which tasted as good as it looked. I was initially skeptical about whether black olive would work with cheesecake when I first saw what was in store for dessert. But boy was I converted from the very first bite. The savoury black olive ganache base was wonderfully subtle and worked wonders with the salted caramel to balance the richness of the cheesecake. Arguably my favourite dish of the evening. 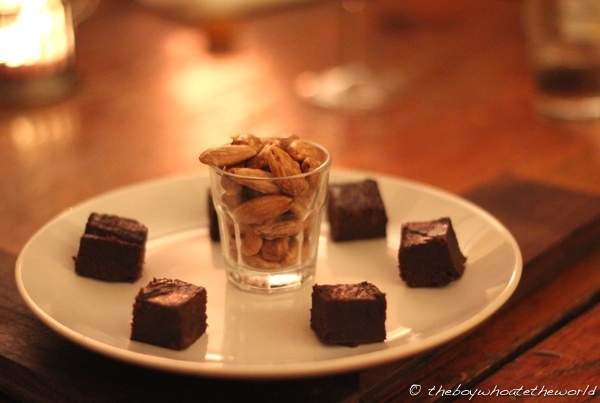 A selection of petit fours soon followed, bringing the curtains down on our banquet. Stuffed by now and having polished off 2 of our BYO bottles amongst our group of 3, it was time to call it a night. Reflecting on the experience, given the experimental combos and molecular techniques at play here, there’s a risk that the odd course may not be to everyone’s tastes. 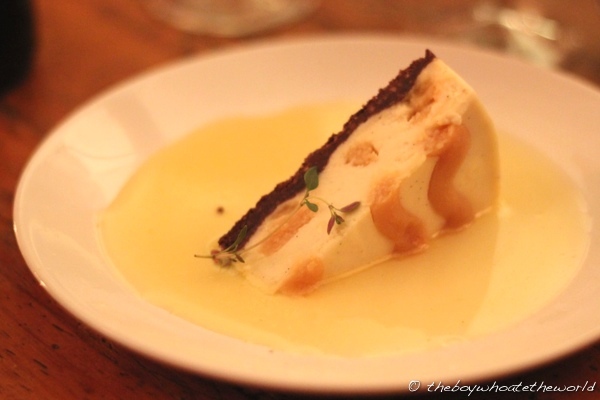 But in contrast to most supper clubs where the focus is on ethnic home-style cuisine, Ferdies deserves credit and praise for pushing the boat out with his cooking. The suggested minimum donation of £45 a head however is priced somewhat towards the upper end of London’s supperclub scene. It’s worth bearing in mind though that a quarter of the takings here go towards the Toynbee Hall foundation which aims to tackle poverty and disadvantage in East London. If the good cause, creative cuisine and social experience doesn’t give you reason enough to visit, there’s always the charm of the venue that will undoubtedly leave you with a supper club experience to remember. I’m a bit biased as I’m Ferdie’s mum but what can I say? – the boy can cook! He’s worked hard to make the Supper Club a success and it’s paying off. Mrs F! So nice to hear from you. Yes, your boy can definitely cook! Was a volunteer in his kitchen in his recent event and learnt a fair bit from him. The skills must come from you I imagine!! Nice to hear from you too. I wouldn’t want to work in a professional kitchen – too hectic – but here at home it’s different. This morning I’ve invented a new pud (which I will launch onto the world once I have perfected it!) so maybe he has inherited some culinary creativity from his mum. But we cook different things – Simon loves meat and I prefer fish and I definitely have more of a sweet tooth. Guan, Thank you for this amazing write up I’m really made up! All of us work really hard at ferdiesfoodlab to make the whole experience different, tasty and sociable : ) I’m so glad you had a nice time!! Guan you’re welcome in my kitchen anytime! Great work, thank you!